But rather than nominate other people, I’d just like to list some of my favorite blogs at the end and hope you check them out. Anyone who would like to participate and answer the questions, please feel free to do so… if you’re following my blog, consider yourself nominated! Name seven things you love about yourself. 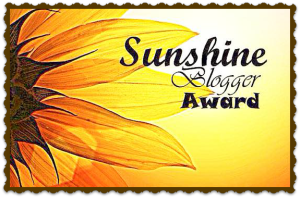 Nominate and notify seven bloggers about this award. Don’t forget to display the award in your post. 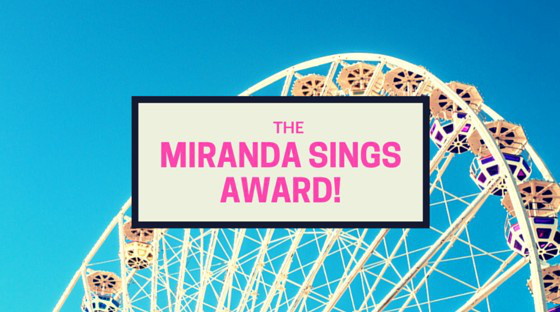 I was nominated for this award by the lovely Lennon Carlyle at Fabulous with Glitches. She is loads of fun, gorgeous and super nice. If you haven’t checked out her blog, you need to drop by, especially on Wednesday for her Hump Day posts. Hilarious! I hope I can come up with seven things I love about myself. I think writers tend to be our own worst critics sometimes. Where in the world would you like to live for the next 6 months if money and responsibilities were of no concern? Maui. I feel at peace there. What is your favourite part of a rainbow? So many things, the colors, the rain ending, the pot of gold at the end! Why do you not forgive your worst enemy? I don’t really feel that I have an enemy. How many smiles do you think you could give people in a single day? An infinite amount, you can’t put a number on happiness! When will you be famous? Oh, I already am in some circles. Nope, I don’t wish to elaborate. Who is your idol? Uhm, Billy? Do you dream in colour (do you dream at all?) I often dream, it feels like it’s in color. Describe the sensation of falling off the edge of a tall building in a dream. I would never be up there on the edge. I’m pretty afraid of heights. Instead, what if I tell you a recurring dream I sometimes have? I’m in a car that’s driving along a narrow road and comes to a bridge. After we drive onto the bridge, I see that water engulfs the road at the end and as we continue forward, we’ll plunge under water. This is where I wake up! I really would like to know what it means. Does anyone know what it would mean? 5. One weird fact about yourself It MUST be weird I have the musical taste of a 10 year old girl. I apologize. 11. All time favorite movie? (more than one is also fine. I understand :D) I love White Christmas and The Holiday, romance and Christmas, nothing better! 1. I don’t cook much, but I watch Food Network like a champ! 2. I love most sports. Right now it’s baseball and watching my Chicago Cubs! 3. I think laughter makes the world go round <3. But love is pretty great, too! 4. I’ve had to give up extreme sports (well, that’s what the doctor said!) because I found out I have a genetic blood clotting disorder and have to take blood thinners. And now I’m lamenting that I never tried skydiving, although the whole fear of heights thing probably would be a problem. So, thanks, mom or dad, for this one, along with my brown hair and eyes and anxiety disorder! Hahaha, you are totes adorbs! The TMI was so funny, Diane. Your writing is great, you are a delightful and kind blogger, which demonstrates all the qualities to deserve are nominations! I just love the TMI posts! It’s fun getting to know other people!! (I have no idea what your recurring dream could mean… maybe it’s representing some kind of challenge or roadblock that you may be up against right now, :D… eh, it’s the best I can do, hehe). Have a great weekend! Oh, Linda, thanks! I’m not much of a cook but I have tried several recipes from your site and loved them all! Aww, girl, I love your honest, open way of writing! Muwahhh back at ya! I’m working my way down your Favorites list and loving all those. How fun! New blogs to follow! Thank you for doing this! I enjoy doing these posts, too! The hardest part for me is the mechanics of linking up, etc. It takes me a little while, but I can do it now! Yay!! 🙂 PS you inspired me to try again! You definitely should. It is fun and I, for one, would like to know more about you! Sounds like a dare… 🙂 I love those! Love getting to know you, and love you’re sense of humor! Oh, thanks! I always feel bad that it takes me awhile to respond to these. I really am so pleased to be recognized! That’s so funny that we were both motel maids! Maybe that’s why I hate cleaning the bathrooms now 😉 I don’t know what it is about the holidays — my mom told me I was always like that! Diane, you are one of a kind! And I mean that as a huge compliment! I’m a huge sports fan, too and usually end up hanging with the men at gatherings, while their wives talk about me behind my back in the kitchen! 😝 Thanks for the nomination. I have a couple to catch up on myself. So I will get to this as soon as possible. You’re awesome, my friend! Thank you, my friend, you are one of a kind, too! It’s no wonder we are friends! Oh, I hope so. Just feeling a bit overwhelmed with lots of stuff at the moment but it’s there, at the back of my mind! Always meaning to but never getting around to … one day! Thanks, it is kind of stressful cause I put it off too long, then end up with several to combine! Oh, no, don’t let it, just have fun with it! Awwww Diane, adopted daughter , I cannot find enough words to say how much that means to me so sending you a zillion hugs ❤ I look upto you and respect you in so many levels and consider knowing you in my blogging journey as a blessing. Thank you so much for doing this and I loved your answers 🙂 TMI is awesome 🙂 It just connects people whom you already know closer together and leaves you beaming when you finish reading it. Thanks, Minaxi, hope all is going well for you two lovebirds! You are just such a sweetheart and I’m glad we’re blogging friends!